DESTINY is usually said to lurk in heavy drapes of purple velvet, in the wicked glint of a crystal ball, behind a veil of heady incense or in the tuck of a gold-chiffon turban. 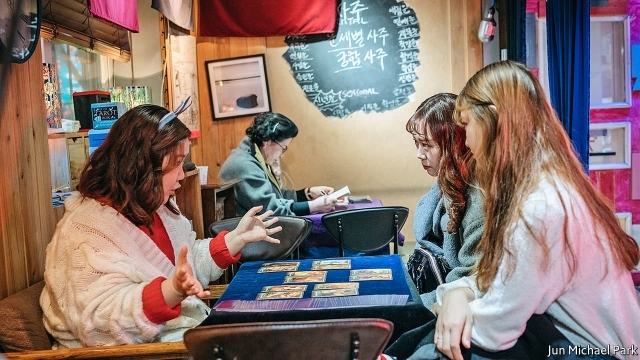 Your correspondent went in search of hers among a crush of Korean schoolgirls at the “Broken Heart Tarot Club” in booming Hongdae, a university district in Seoul. The café’s façade is an inviting jumble of pink neon signs and glowing graffiti. At the next table, a hip tarot reader spread a deck face-down for two girlfriends in oversized denim jackets, who took turns picking out cards and sipping on their lattes. He looked as cool as them, more rapper than rune-reader, in dark glasses with a chain around his neck. Interrogating the decorated cards costs 3,000 won (about $2.75) a question. A tarot reader assesses the character of her clients first. Two flicks of her wrist, and a pair of Queens appears. “You chose the strongest set in the deck,” she says brightly. “Fame is within reach.” Will a move to a new country go smoothly? The Beggar. “The start will be hard, but you can succeed if you ask for help.” Will the Koreas go to war? Death and The Emperor show up, apparently the tarot incarnations of Kim Jong Un (here a scythe-wielding woman in blue veils) and Moon Jae-in, the leaders of North and South Korea. “Death plays tricks but the Emperor is wise,” the reader assures. “Broken Heart” is among dozens of fortune-telling businesses on the street, packed between cheap clothes and cosmetics shops. Business is brisk. Other stores offer the Korean arts of face-reading, palm-reading—one entices clients with a detailed mapping of Barack Obama’s raised hand at his presidential swearing-in—and saju. An ancient form of divination, saju analyses the cosmic energy at the hour, day, month and year of a person’s birth from Chinese astrological records and texts. A seer at “Broken Hearts” says she began to study saju two decades ago (she says she found it hard to trust other fortune-tellers), but took up tarot recently to keep up with the times. “The young like it. The cards are pretty, it’s cheap and it’s quick,” she says. The otherworldly in South Korea will soon be a 4trn won ($3.7bn) business, predicts the Korea Economic Daily, a local newspaper. Paik Woon-san, head of the Association of Korean Prophets, estimates that there are over 300,000 fortune-tellers in the country, and 150,000 shamans, many of whom provide clairvoyance. Unusually in a country of evangelical Christians and devout Buddhists, it continues to thrive as anything from a bit of curious fun to a dependable guide for making everyday decisions. Now fortune-telling apps for smartphones are beguiling city kids, taking the occult into the otherworldliness of cyberspace. Handasoft, a software developer, has launched 13 apps in the past five years. Its most popular, Jeomsin, introduced two years ago, has been downloaded over 3m times. Every morning it sends users their personalised fortune for the day (other mobile prophecy-providers sell their detailed user data on to marketers, but Jeomsin makes money only from ads). Proffer your palm to the camera or snap a selfie, and another app provides instant face- and palm-reading. Shin Hyun-ho of Jeomsin reckons two or three new apps are being launched every day. More than two-thirds of those surveyed by Trend Monitor, a local market-research firm, said they see a fortune-teller at least once a year. Many visit between December and February, to see what awaits them in the new solar and lunar years. At Kyobo, South Korea’s biggest bookstore chain, as many shelves are devoted to deciphering destiny as to understanding Korea’s modern history, with primers including “Your Winning Lotto Number is in Your Dreams”. Diviners appear regularly in television dramas, sometimes as fraudsters but often to foreshadow a plot twist. In “The Face Reader”, a gifted seer employed by a 16th-century king correctly identifies traitors from their facial traits. It was among the highest-grossing films of 2013. 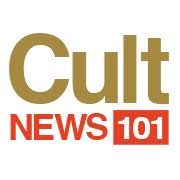 Andrew Eungi Kim, a professor at Korea University, says soothsayers hold an everyday relevance in South Korea that they do not have in the West. He likens dropping in on one to occasional Sunday churchgoing in the West. The practice is passed on within families—as “one possible way by which to make sense of the world”. Big junctures in life are a common time for a celestial steer. Careers fairs at Hankuk University of Foreign Studies, in Seoul, reserve places for tarot readers. Students go to saju masters with lists of potential employers to determine those most likely to hire them. Businessmen might go to one to select a propitious date to launch a new venture. New parents routinely visit name-makers, another branch of fortune-telling, to help decide on the luckiest name for their baby. Couples check their compatibility before marriage, and one or both may be advised to change their first names to improve their matrimonial lot. In the past decade 1.5m Koreans have legally taken a new one. The clairvoyance business has also been able to thrive because fate is not fixed in Korean cosmology. Bad news can be mitigated with charms, often given in the form of an action: take up a religion, take out health insurance, stop eating red meat, do not even think about getting a tattoo. Repeat clients are thus ensured. Some even drop in for a weekly check-up. As palm lines and facial features evolve with age, so too, it is thought, does fortune. Rather than put a brave face on a luckless situation, a small number of Koreans simply change theirs. Some plastic surgeons have been educating themselves in physiognomy to advise their clients. (In “The Face Reader”, rivals to the throne modify the face of a contender to get the king to banish him.) Purists in the face-reading business lament that their jobs are getting tougher in plastic-happy Korea. In the posh district of Apgujeong (part of stylish Gangnam) the entrance hall of a prominent saju café is plastered with autographs from glitterati. Sotdae Saju Cafe offers clairvoyance with cocktails. Its saju master says counselling is the biggest part of his job. “A lot of rich types around here are dissatisfied. Not long ago South Koreans were trying to survive. Now they’re trying to be happy,” he says. Tae-young, a 30-something Seoulite, says she goes for a reading whenever things get too much, or if something worrisome is on her mind. Some say readings help them to accept whatever unhappy situation they are in. Few of those who see fortune-tellers take the readings as fact. Many say they offer an additional perspective. In a country where mental troubles are taboo, this is useful. Lim Chaewoo of the University of Brain Education in the city of Cheonan, south of Seoul, says that as modern societies have grown more complex, making decisions has become exacting. During the financial crisis in 2008, American stock traders and insurance brokers, themselves givers of advice, turned to psychics for a steer. Theirs seemed as good as any, in the circumstances. That saju and face-reading are recognised as academic pursuits in Korea also lends them some modern-day credibility. Janet Shin, a saju master and newspaper columnist who also lectures at universities, says that her clients include doctors, professors and religious types. Status within the profession is achieved through study and experience, as in other disciplines, rather than bluster. Kwon Hee-gwan, who offers readings from soothsaying tents near Tapgol Park in Seoul, is a firm believer in this. On a recent weekday evening, wearing a navy-blue cardigan and tie, he delicately examined clients’ palms with a bone-handled magnifying glass. Mr Kwon sees as many as 20 faces a day, and has worked on a total of 10,000 in his career. But that is only half the number necessary, he says, to know a client’s troubles as soon as she enters his tent. Some contend that this is not as mysterious as it sounds. Face-readers consider cues like posture, body language and tone of voice in assessing a customer, much as people naturally assess physical appearance to guess someone’s emotional state. In pre-industrial Korea, when few people left their place of birth, many thought people’s faces were a record of their lifestyles and so in some ways a guide to their fate. Researchers even suggest that palm lines may be a “fossilised record” of a person’s earliest moments, because they develop early in the womb. Maybe, then, they hint at a baby’s future health. If computers could process and dissect what contributes to human intuition, might they become the fortune-tellers of the future? In 2016 a computer programme beat Lee Sedol, a South Korean who is among the world’s best (human) Go players, by four games to one. Even the clairvoyants had not seen that coming. Already, robots are being taught how to anticipate human actions—in effect, reading the future. Researchers at the Massachusetts Institute of Technology have trained a system to foresee when two actors will kiss, shake hands, hug or high-five by feeding it millions of hours of television dramas. Chinese researchers have trained a computer to distinguish between criminals and non-criminals nine times out of ten. For many, all this portends a rather fearsome future. But a pair of South Korean artists at LOVOT LAB, a startup, offer a different vision. The pair tinker and exhibit above an old rubber-and-metals workshop in Mullae-dong, a run-down industrial neighbourhood of Seoul. In a corner of their studio, a small white robot sits cross-legged, surrounded by coils of sweet-smelling incense. “Buddha I” (pictured) has been programmed to read faces to detect a few basic emotions including happiness, anger and sadness, and dispenses lighthearted prophecies accordingly. Hong Hyuns of LOVOT LAB has never been to a fortune-teller. But part of his inspiration came from cracking open a fortune cookie. The prophecy told him to “go east”. As he had already decided to move from Chicago to New York, this put him “in a good mood”, he says. Many perfectly rational folk have been found to adjust their behaviour, even in tiny ways, after taking advice from cookies. Mr Hong was struck by how many go to have their fortunes read even as they laugh it all off. This article appeared in the Asia section of the print edition under the headline "Prophets and profits"